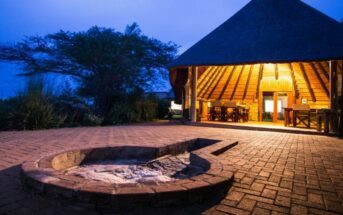 I am always looking for somewhere new to stay and especially in Hluhluwe-Imfolozi Park. The park has become a pilgrimage site for me over the years and when researching my last trip I realised I had never stayed in the rondavals, in the northern Hluhluwe section. The traditional ’round’ walled thatched huts run in a line away from the main Hilltop camp towards the public swimming pool. Each has twin beds, cupboard space, a small sink, fridge and a kettle. There is also a table and chairs and barbecue outside each hut. The ablutions and kitchen are shared facilities. Both were immaculate and the kitchen was kitted out with everything one would need to fully self-cater. There is also the option of using the cafe, restaurant and bar at Hilltop which is a two minute drive away. All through the day around the camp and huts you are close to wildlife. Samango and vervet monkeys are watching you watching them. On the grass areas bushbuck graze un-fazed by people wandering around. In the thicker bush I spotted duiker, their bright rust coats standing out against the greenery. Winter is a dry time in Zululand with very little, if any, rainfall. As I drove the roads of both Hluhluwe and Imfolozi there was a clear visible split between the two areas. The northern Hluhluwe area was quite lush and green and had clearly had some rain. Whereas the Southern Imfolozi section was starting to look drought ridden. This reflected in the sightings. In the north there was plenty of plains game in large herds along with many elephants and buffalo. In the south sightings were sporadic. 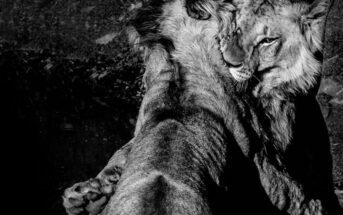 However I was indescribably lucky to find a young pair of amorous lions mating only a few metres from a road. They lay separately in the shade, then the male approached the female, they mated with a great deal of noise, and then went back to their shady spots. This continued on and off for the thirty minutes I sat there. During the early hours of my first night the rains came to the whole park and many other areas of Zululand. They came like the monsoon accompanied with thunder, that drowned out every other noise, and lightning which lit the up the night like a flashing strobe. It was impossible to sleep and even when daylight dawned the storm continued. I drove for the first hour of daylight unable to see beyond a few meters from my vehicle as the storms raged on. By mid-morning the rains had moved south and the park was now under warm blue skies. Wallows were full of water again and streams flowed. Rivers, that over the years, I had never seen with more than small pools connected by barely moving narrow streams were now in full flow. The Black Imfolozi River roared down and filled its broad bed from bank to bank, spanning over 100 meters. As this could well be a once a in a lifetime sight for me, I sat for some time and just watched the raging torrent gather pace. Making my way back to camp I encountered a road block. I sat with another vehicle on the top of a hill looking down on two other vehicles at the bottom, probably a kilometre away from us. 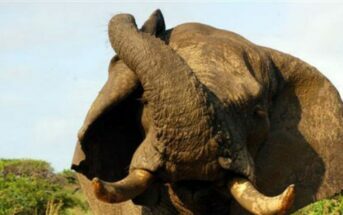 There was no piggy in the middle, just an enormous bull elephant. It became a game of car and elephant that went on for nearly an hour. Eventually the big bull, having had his fun, wandered off into the bush and let us pass. The drama did not stop there: Only a few kilometres from camp and two hours from darkness a dry river bed was dry no more. I had never realised, on many prior trips, that there was even a river there. Only a few months earlier I had sat and watched a crèche of baboons, playing and feeding on figs in the very same spot where now a torrent of water flowed. The barely visible concrete bridge, flanked by sand and palm trees, was now under a wall fast flowing water over a metre deep. Vehicles approaching from the north turned around and headed back in the direction from where they had come. On my side there were soon seven cars parked up. Other cars came but turned around and headed back south. It was a waiting game but acting under local knowledge we were told that the water would subside within an hour. After an hour the first two vehicles attempted the crossing. I should point out they were both big 4×4’s. The first crossed with relative ease. The second had us on the edge of our seats as it was swept to within a few centimetres of the edge of the bridge. We all gasped and watched as it very slowly made its way back in line and through the wall of water. Thirty minutes later the next two vehicles made the crossing in what was now a wall of water that stood at “only” the height of the tops of the vehicles wheels. The remaining vehicles sat and watched as the sun began to set. It was time to make a plan. This is not the opening to a joke; however, there was an Englishman, a German and a South African. Me in my Rav4 borrowed from my in-laws. The South Africans in their tiny Toyota hire car and the Germans in their large combi. The Germans made the plan. “You go first” I was told. “You go second” The South Africans were told. “We will go last” The German’s told us. “We will leave no one behind!”, they assured us. I was nervous, the South Africans were more than nervous, and the Germans were confident. It was a white knuckle drive struggling with a side current on a base of mud. I aimed the Rav4 on an agreed path, as shown to us by the Germans. The car moved forwards and only slightly sideways before wheel spinning out of the mud and onto the tar. Within ten minutes the mini league of nations were all safely on the tar. It was smiles and handshakes all round before heading safely back to camp.